Pay attention to fishing nets, when you enter into Nanao. My planned route (i.e. the red line on Google map) didn’t hit any fishing net. 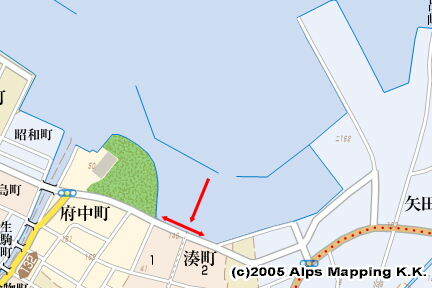 In the north (right) side of the waypoint “NANAO1” 37 07.100N　137 04.200E, you will be fairly close to a fixed fishing net. No short cut in the shore side. When I was approaching Koguchi, which is the entrance of Nanao Minami (South) Bay, the current was against me and max 1.5kt. I also saw many algae flowing. When you approach Koguchi from the north, you can see three grass-green colored tanks clearly. The entrance is in the north (right) of them. Moving in with 269 degrees bearing, you will see the first red buoy, which is No.2. Green No.1 buoy on your left. Then, red No.4 buoy and green No.5 buoy. The last red buoy is No.8 and the last green buoy is No.7. Leaving the last red and green buoys, move into with 241 degrees bearing. You will see red No.10 buoy to your right. Passing through between red No.12 buoy on your right and green No.13 buoy on your left, you sail toward the red lighthouse of Nanao Port. Around Koguchi and even around the center of the bay, there are many fishing flags. Those are independent, not connected each other like fishing nets. But, those anchor lines have fishhooks under the sea. Green O-jima Island and Me-jima Island can be seen clearly. I was sailing just above shallow area “Tenjin awase” with 4.5m depth though, there was no problem. Passing by the red lighthouse at 37 02.930N 136 58.350E on your right, you move through the narrow entrance. 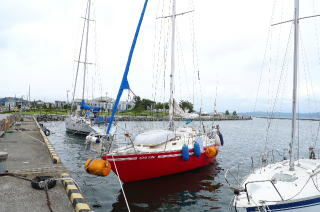 Sail boats were moored in the right side of the quay in front of you. There was enough open space for mooring. I moored bow-to in the left of a big sailing boat “Penny Lane 5” which was moored at the innermost quay. No wave. There is a wooden walkway in front of me. Water, toilet and provisions are nearby. Here is a very good berth with no problem. A public bathhouse is 7 minutes walk away at a street in the one-block seaside of Ippon-sugi Street. Another big one is 10 minutes away in the back of Patria near the station. There is a clean western style toilet 3 minutes walk away in a beautiful park in front of you. A water tap for drinking is 3 minutes walk away in the park. A coin laundry is 5 minutes walk away next to a barber shop. Walk from Ribbon Street and turn into a narrow street at one-street back of a big street of the port. Nobody knew it around the port. Provisions: A middle sized supermarket “Dontaku” is 5 minutes walk away at Ribbon Street. Another big supermarket is 8 minutes away in Patria near the station. Fuel service is 3 minutes away at Shell.